To the peach pulp add the lemon juice and 1 cup of the sugar--all to stand 1 hour. Add the other cup of sugar and salt to the beaten eggs. Then blend in half of the milk. Cook the sugar, egg, and milk mixture over boiling water to create thick custard. Cool. 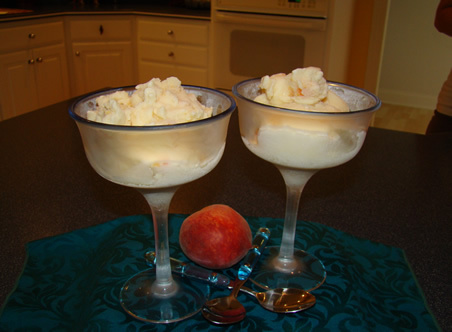 Add the remainder of milk, the cream that has been partially whipped, the flavoring, and sweetened peach pulp. Freeze using 1 part salt to 6 parts ice. Recipe makes 1 gallon of ice cream.